jelly-roll pan and line with parchment paper. Separate the eggs. In small bowl, with mixer at high speed, beat egg yolks, vanilla, and 1/4 cup granulated sugar until very thick and lemon colored, about 5 minutes. Set beaten yolk mixture aside. In large bowl, with clean beaters and with mixer at high speed, beat egg whites, cream of tartar, and salt until soft peaks for. Beating at high speed, gradually sprinkle in 1/4 cup granulated sugar until sugar dissolves and whites stand in stiff peaks. Transfer beaten egg yolks to another large bowl. With rubber spatula, gently fold beaten egg whites into beaten egg yolks, one-third at a time. Sift and fold flour, one-third at a time, into egg mixture. for 10 minutes or until top of cake springs back when lightly touched with finger. Meanwhile, in a cup, mix 2 tablespoons orange liqueur with 1 tablespoon water and 1 tablespoon sugar until sugar dissolves. Sprinkle clean cloth towel with confectioners' sugar. When cake is done, immediately invert hot cake onto towel. Carefully peel off parchment paper and discard. Brush cake with orange-liqueur mixture. Starting from a long side, roll cake with towel jelly-roll fashion. Cool cake roll, seam side down, on wire rack until completely cool, about 1 hour. To Make Ricotta Filling: In food processor, with knife blade attached, blend the ricotta cheese, cream cheese, 1/2 cup confectioners' sugar, 1/2 teaspoon vanilla and cinnamon. until smooth. Transfer filling to bowl and stir in 1/4 cup of the chocolate pieces. Cover and refrigerate filling while cake cools. Assemble Cake: Gently unroll cooled cake. With metal spatula, spread filling over cake almost to edges. Starting from same long side, roll cake without towel. Place rolled cake, seam side down, on platter. To Make Frosting: In small bowl, with mixer at medium speed, beat whipping cream and 3 tablespoons confectioners' sugar until soft peaks form. With rubber spatula, fold in 2 tablespoons orange liqueur and 1/2 teaspoon vanilla. 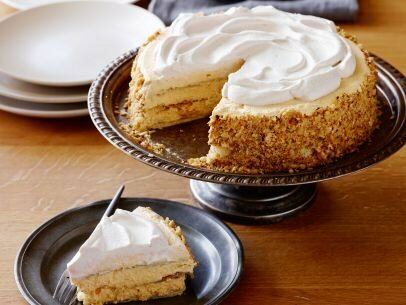 With metal spatula, spread whipped-cream frosting over cake. Refrigerate cake at least 2 hours before serving. Sprinkle top of cake with chopped pistachios and chocolate pieces just before serving. Heat oven to 350°F. Toss frozen berries with granulated sugar, and spread evenly in bottom of 13x9-inch pan. Top evenly with cubed cream cheese, then sprinkle evenly with dry cake mix. Pour melted butter evenly over top, covering as much cake mix as possible. Bake 50 to 60 minutes or until top of cake is light golden brown and bubbling on edges. Cool 10 minutes. Sprinkle with powdered sugar just before serving. Serve warm. Preheat oven to 275°F. Line a muffin tin with cupcake liners. Place an Oreo in the bottom of each one. In a large bowl, beat the cream cheese and sugar together until smooth. Beat in vanilla extract, eggs, sour cream, and salt. Continue beating until combined and smooth. Add a heaping tablespoon of cheesecake batter to each muffin cup. Warm the hot fudge sauce in the microwave for 20 seconds. Place a scant teaspoon of hot fudge into each cupcake. Add another tablespoons of cheesecake batter on top, filling the cupcake liner. Use a toothpick or butterknife to gently swirl the fudge into the cheesecake mix. Bake in the preheated oven for 22-25 minutes until filling is set. Cool completely in the tin before removing. Store in refrigerator. Fudge swirl can also be replaced with Nutella. With an electric mixer, beat together sugar, butter, eggs, and vanilla until well blended scraping bowl often. Then beat on high speed for 5 minutes, scraping bowl occasionally. Mix together the flour and baking powder. In a separate bowl, combine the milk and rum. Add liquids and flour alternately to batter, blending well after each addition. Gently stir in pineapple and coconut. Pour batter into a greased and floured 6 cup bundt pan. Bake in preheated 350°F oven for 45 to 50 minutes until cake begins to pull from the sides of the pan and a wooden pick inserted comes out clean. Remove from the oven and while still in the pan, pour 1/4 cup rum over the cake and seal quickly with foil to prevent evaporation. Cool in pan on a rack for 20 minutes, then turn out, invert and let cool completely right side up. Preheat the oven to 350° F. Make the cakes: Brush four 1 1/4-cup brioche molds (or use 10-ounce ramekins or jumbo muffin cups) with the 2 tablespoons melted butter. Dust the molds with cocoa powder and tap out the excess. Whisk the flour, baking soda, baking powder and salt in a small bowl. Bring the milk and 3/4 cup water to a simmer in a saucepan over medium heat; set aside. Combine the vegetable oil, 4 tablespoons room-temperature butter and the sugar in a stand mixer and beat with the paddle attachment on medium-high speed until fluffy, about 4 minutes, scraping down the bowl and beater as needed. Add 1/2 cup cocoa powder and the vanilla; beat 1 minute on medium speed. Scrape down the bowl. Add 1 egg and beat 1 minute on medium-low speed, then add the remaining egg and beat 1 more minute. With the mixer on low speed, gradually beat in the flour mixture, then the hot milk mixture. Finish mixing the batter with a rubber spatula until combined. Divide the batter evenly among the molds, filling each slightly more than three-quarters of the way. Transfer the molds to a baking sheet and bake until the tops of the cakes are domed and the centers are just barely set, 25 to 30 minutes. Transfer the baking sheet to a rack; let the cakes cool until they pull away from the molds, about 30 minutes. Make the Filling: Microwave the chocolate, cream, butter and corn syrup in a microwave-safe bowl in 30-second intervals, stirring each time, until the chocolate starts to melt, 1 minute, 30 seconds. Let sit 3 minutes, then whisk until smooth. Reheat before using, if necessary. Use the tip of a paring knife to gently loosen the cakes from the molds, then invert the cakes onto a cutting board. Use the knife to cut a 1 1/2-inch circle on the top of each cake, cutting almost to the bottom. Hollow out the cake with a spoon; save the scraps. Wrap the cakes with plastic wrap and microwave until steaming, 1 minute. Drizzle plates with caramel, then unwrap the cakes and place on top. Pour about 3 tablespoons filling into each cake. Plug the hole with a cake scrap. Save or discard any remaining scraps. Top each cake with a scoop of ice cream. Spoon more chocolate sauce on top, spreading it thin so it hardens into a shell. Mix first 5 dry ingredients in a greased 8" square baking pan. Make 3 depressions in dry ingredients - two small, one larger (see #3 in photo below). Pour vinegar in one depression, vanilla in the other and the vegetable oil in third larger depression. Pour coffee and Kahlúa over all. Mix well until smooth. Bake on middle rack of oven for 35 minutes. Check with toothpick to make sure it comes out clean. Cool. Top with your favorite chocolate frosting or sprinkle with powdered sugar. Enjoy! Using a large microwave safe mug, spray the inside with non-stick cooking spray. Next, mix the first 5 dry ingredients in the mug. After mixing well, make 3 depressions in dry ingredients. Pour vinegar in one depression, vanilla in the other and the vegetable oil in third depression. Pour coffee and Kahlúa over top. Mix well until smooth using a fork. Place in microwave and cook on high for *2 minutes, uncovered. Check with toothpick to make sure it comes out clean. Be sure not to over cook! Top with whatever you like - powdered sugar, frosting, chocolate chips, whipped cream. Enjoy hot or cold. Each microwave cooks differently, adjust time accordingly! One person made the cake in 1 minute 40 seconds, and another in 1 minute 20 seconds. If you overcook the cake, it may ruin it. Be sure to watch as it bakes. 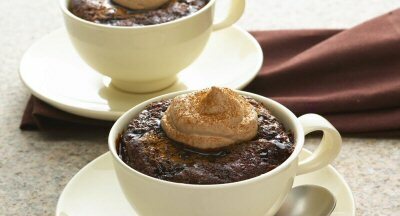 If you want a neater mug cake, mix the cake batter in a small bowl, then pour the batter in the mug. You can add mini chocolate chips to the batter for a super rich chocolate cake...or do what I did, throw some on top after you make it, while it's still warm! Mmm, mmm good! In a large bowl, beat the cream cheese until smooth. Add the eggs and vanilla and beat together. In separate bowls mix your topping and cake batter. Next pour in your cake batter. Bake in oven for 20-25 minutes. Poke with toothpicks, when you can pull them out clean they should be done. Now for the fun part, turn them upside-down, plate, smile, and dig in. Prepare the cake mix and bake in a 9-by-13-inch baking pan according to package directions. Let cool for 10 minutes. Position the cake with the long end closest to you. Evenly space the chocolate candies in 5 rows down the center of the cake (there should be 6 chocolates per row). 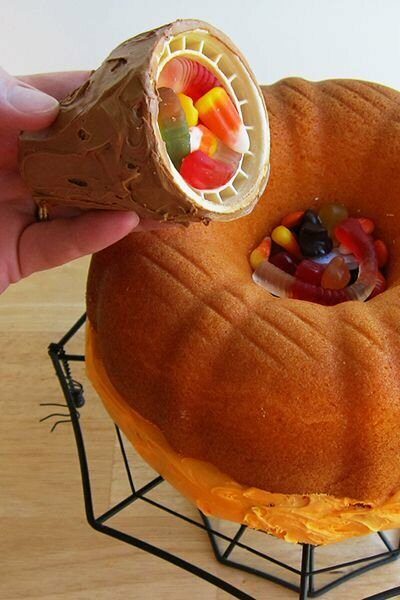 Use the handle of a wooden spoon to push all of the candies into the cake. Cool completely. Meanwhile, prepare the pudding according to the package directions and set aside. Beat together the cream, sugar and vanilla in a medium bowl with an electric mixer on medium-high speed until soft, billowy peaks form, 3 to 4 minutes. Preheat the oven to 350°F. Grease a 13-by-9-inch baking pan with butter and dust with flour. Preheat oven to 425° F and butter the cavities of a 6 cavity jumbo muffin tin. Using a spatula, gently stir in flour and salt. Don't overmix. In a medium bowl, combine the Kahlua and sweetened condensed milk until combined. Used the hand of a wooden spoon, poke holes all over the cake. Pour liquid mixture over the cake. Beat all ingredients in a large bowl or stand mixer on medium-high speed until light and fluffy. Frost cake and top with chocolate sprinkles if desired. Preheat oven to 400°F. Brush 30 cups of 2 mini-muffin tins with butter, and dust lightly with flour. Melt butter in a medium skillet over medium-high heat. When it begins to sputter, reduce heat to medium. Cook, swirling skillet occasionally, until butter has lightly browned. Skim foam from top, and remove skillet from heat. Whisk together flour, ground almonds, sugar, and salt in a bowl. Add egg whites, and whisk until smooth. Stir in kirsch. Pour in butter, leaving any dark-brown sediment in skillet, and whisk to combine. Let stand for 20 minutes. Ladle 1 tablespoon batter into each buttered muffin cup, filling about halfway. Push a cherry into each, keeping stem end up. With a small spoon, smooth batter over cherries to cover. Bake until a toothpick comes out clean and cakes are golden brown, 12 to 15 minutes. Let cool 10 minutes. Run a knife around edges to loosen, and unmold. Cakes can be stored in airtight containers at room temperature overnight. Butter the cupcake pan and set aside. Preheat oven to 350°F. Cream the butter and sugar together with a mixer until really light and fluffy. Add the vanilla and mix some more. In a separate bowl, whip up the egg yolks until light yellow. Add to your butter mixture and mix it together with a wooden spoon. Sift in the flour and mix together - the batter will be really stiff, but don't worry, we'll fix that later. In another bowl, whisk your egg whites until they've reached stiff peaks. Take about a quarter of the egg white and stir it into the batter to lighten it up. Take the rest of the egg whites and carefully fold it into the batter until everything has just begun to come together. Slowly fold in the heavy cream. In an saucepan, whisk together the butter, sugar, juice, and zest over low heat and cook for about five minutes. Add the eggs and cornstarch, whisking briskly to combine, and continue to cook while stirring for about 5 to 7 minutes. At this point the mixture will thicken. Remove from heat, pour into a large bowl, and cover tightly with a piece of plastic wrap. Make sure the wrap is touching the top of the curd, or a real nasty skin will form while cooling. Cool in the fridge for at least one hour before using. Take two cakes - spread the cooled curd on one side and buttercream on the other. Sandwich the two cakes together and sprinkle with powdered sugar. Enjoy with a spot of tea. For the caramel topping: Preheat the oven to 350°F. Butter just the sides of a 9-inch round cake pan. Stir the sugar and 1/3 cup water together in a medium saucepan over medium heat until the sugar dissolves. Cook, no longer stirring but gently swirling the saucepan occasionally, until the mixture is amber, 6 to 8 minutes. (If needed, brush any sugar crystals off the side of the pan with a pastry brush dampened with water.) Remove the saucepan from the heat, and carefully whisk in the butter (use caution; the mixture can bubble up considerably). Pour the caramel into the prepared cake pan, tilting the pan to cover most of the bottom (be careful; the pan will be very hot from the caramel). Toss the rhubarb and strawberries in a medium bowl with the cornstarch, strawberry jam and a pinch of salt. Spoon on top of the caramel sauce and smooth into an even layer. Set aside. Beat the butter and sugar together with an electric mixer on medium-high speed in a large bowl until light and fluffy, about 4 minutes. Add the eggs 1 at a time, beating after each addition and scraping down the side of the bowl as needed, then beat in the vanilla. Reduce the mixer speed to low and add the flour mixture in 3 batches, alternating with the milk-sour cream mixture, and mixing until just incorporated. Pour the batter over the rhubarb and strawberries in the cake pan and spread evenly. Bake until the cake is golden brown, bounces back when pressed and a toothpick or cake tester comes out clean when inserted in the center, 55 to 60 minutes. Run a knife around the edge of the cake to separate it from the pan. Let cool in the pan on a rack until cool enough to handle and almost room temperature, about 1 hour. Invert a serving platter over the cake pan and, while holding them together, quickly flip them over so the cake unmolds, fruit-side up. Let cool completely. Cut into wedges, and serve. Preheat the oven to 300 ° F.
Sift the flour together with 1/2 cup of the sugar and set aside. Put the egg whites in the bowl of an electric mixer. Be SURE that the bowl is clean and dry, any fat in the bowl can prevent the egg whites from whipping up fluffy fluffy fluffy! Add the salt and the cream of tartar to the egg whites. Beat the egg whites on a medium-high speed until they reach soft peaks, about 5 minutes. While the mixer is running, gradually add the remaining sugar. DO NOT plop the sugar in all at once or it will push the air out of the whites that we are trying to beat in. Add in the vanilla and zests and then stop the mixer. Add 1/3 of the flour/sugar mixture and fold gently fold, do this quickly but gently. Repeat the process 2 more times until all of the flour/sugar mixture is incorporated. Transfer the cake batter into an ungreased tube pan. Bang the cake pan on the counter a couple of times to release any air bubbles trapped in the cake batter. Bake the cake on a sheet tray in the preheated oven until it is light and springy, about 1 1/4 hours. Cool the cake for at least 1 hour before unmolding. Serve with the tropical fruit compote. In a food processor or blender, puree the coarsely chopped mango and 1/2 cup orange juice. If this mixture needs a little more sweetness, add in the 2 teaspoons of sugar and puree for another 10 seconds or until the sugar has dissolved. Combine all of the fruit and remaining orange juice and let the mixture sit at room temperature for 20 to 30 minutes. Prepare box of cake mix according to package instructions, then pour into a lightly greased 9"x13" cake pan. DO NOT BAKE. Set aside. In another bowl whisk together the ingredients for the Pumpkin Pie (pumpkin, evaporated milk, cream, eggs, brown sugar, and pumpkin pie spice), until smooth. Slowly pour the pumpkin pie mixture all over the cake mix. Carefully place cake into the oven and bake for 50-60 minutes or until the center is no longer jiggly, and a toothpick inserted into cake mix comes out clean. NOTE: The cake might be slightly darker than normal, but still tastes great. Let cool to room temperature. Make the frosting: Place the vanilla pudding mix into a large bowl, add the pumpkin pie spice and pour in the cold milk. Whisk until combined and starting to thicken. Gently fold in the Cool Whip until it's completely combined. Spread on top of the cooled cake. You can serve now, or chill the cake, and serve when chilled. Either way tastes great. Enjoy! Before baking the cake, you can place it on top of a rimmed baking sheet just in case any of the cake spills over the edge of the pan while baking. UPDATE: After you are done baking the cake, it may look like it did not settle into layers, but it has! Frost it, cut it, and marvel at it's awesomeness. Put the cream cheese in the bowl of a stand mixer fitted with a whisk attachment (or in a large bowl if using a hand mixer) and whisk on medium speed until fluffy. Add the sugar and a pinch of salt and whisk until smooth. Add the cream and vanilla and whisk just until medium-soft peaks form. Refrigerate until firm, about 2 hours. Line a 1 1/2-quart loaf pan with plastic wrap, leaving at least a 2-inch overhang on all sides. On the bottom of the loaf pan, lay 6 cookies face-down, overlapping slightly. Spread 3/4 cup of the whipped cream evenly over the cookies. Top with 3 heaping tablespoons of the chocolate. Repeat the layering two more times with 6 to 7 cookies. Place the last 6 to 7 cookies on the shaved chocolate. Fold the plastic wrap over the top of the loaf pan so the entire top layer is covered. Refrigerate overnight. To serve, turn back the plastic wrap, flip the icebox cake out onto a platter and remove the plastic. Top with the reserved chocolate and serve immediately. Sift the flour, cocoa powder, baking soda and 1/8 teaspoon salt into a medium bowl. Bake the cookies until brick-red and set, 8 to 10 minutes, rotating the baking sheets halfway through. Let the cookies cool on the sheets for 3 minutes, then transfer to a wire rack to cool completely. Note: Use a heart shaped cookie cutter for a more festive Valentine effect. Preheat oven at 300° F. Cream butter with the sugar. Add eggs, one at a time, beating well after each egg. Add yogurt and lemon extract. In a separate bowl, add salt and soda to the flour. Gradually, add dry ingredients to the egg mixture, beating until smooth and creamy. Pour into greased (generously greased) tube pan. Bake for 50 to 60 minutes before serving. Preheat oven to 350° F. Spray round cake pan with cooking spray and dust with flour. In a medium bowl, mix flour, baking powder and salt. In a large bowl, combine yogurt with sugar. Add eggs slowly and then stir in remaining ingredients. Add flour mixture to yogurt mix. Stir well. Pour in cake pan. Bake for 45 to 50 minutes. Pour chocolate syrup into 12-cup fluted tube pan sprayed with cooking spray. 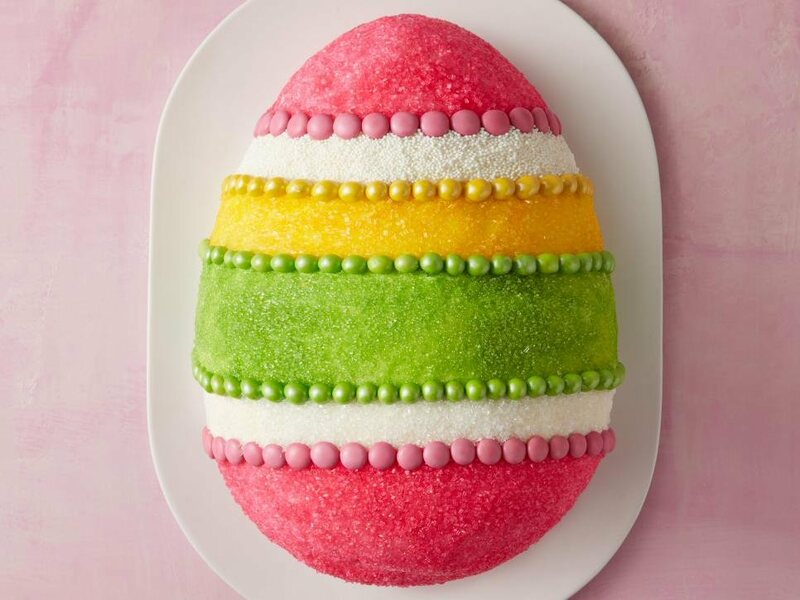 Beat cake mix, water, oil and 3 eggs with mixer 2 min. or until blended. Add sour cream; mix well. Pour over syrup in pan. Beat cream cheese and sugar with mixer until blended. Add remaining eggs; mix well. Blend in evaporated milk and melted chocolate; gently spoon over cake batter in pan. Cover with foil sprayed with cooking spray, sprayed-side down. Preheat the oven to 350°F. Butter an 11-by-17-inch rimmed baking sheet and line with parchment paper; butter the parchment and dust with flour. Bring the cola to a simmer in a medium skillet over medium-high heat and cook until reduced to 1/2 cup, 10 to 12 minutes. Let cool. Whisk the flour, cocoa powder, baking powder, baking soda and salt in a bowl. In a separate large bowl, whisk the granulated sugar, vegetable oil, buttermilk, eggs, food coloring, almond and vanilla extracts, and the cola syrup. Stir the dry ingredients into the wet ingredients until just combined. Spread the batter on the prepared baking sheet; bake until the cake pulls away from the pan, about 15 minutes. Let cool on the pan on a rack, 5 minutes. Dust a kitchen towel (not terry cloth) with confectioners' sugar. Invert the cake onto the towel and peel off the parchment. Trim the cake edges. Starting with a short end, roll up the cake around the towel; let cool completely on a rack. Make the filling: Whisk the cream cheese, 1/2 cup cream and the almond extract in a large bowl. Beat the remaining 1 cup cream and the confectioners' sugar with a mixer until soft peaks form; gradually fold into the cream cheese mixture. Chill until ready to use. Peel & slice apples thinly into 9" deep pie pan. Mix sugar, cinnamon, & sprinkle over apples. Sift next 4 ingredients into a bowl, and add last four ingredients & mix until smooth. Pour over apples & bake 350°F for 45 min. Preheat oven to 325°F. Grease pan with solid short. and flour. Combine oil and sugar in large mixing bowl. Mix by hand (do not use mixer) with a spoon until well blended. Add remaining ingredients, one at a time, mixing well after each addition. Pour batter into prepared pan. Bake for 45 min. Cool 10 min. then remove from pan. Cool at least 1 hour and decorate with stabilized whipped cream. Mix together apples (peeled and sliced first! ), cinnamon and 5 Tbsp. sugar. Set aside. In large bowl, beat together 2 1/2 cups sugar, oil, eggs, orange juice and vanilla until smooth. Sift flour, salt and baking powder together; add a little at a time and mix well. Lightly grease and flour large bundt pan. Put half the batter in pan, then half the apples. Beat sugar, oil, eggs, and vanilla. Add apple with dry ingredients and mix well. Spray a two pound tin can with cooking spray or grease and flour it well. Pour batter into can, filling no more than 2/3 full. Place can in crock pot. Do not add water. Cover but leave cover ajar so steam can escape. Cook on high 3 1/2 to 4 hours. Don't peek before the last hour of baking. Cake is done when top is set. Let stand in can a few minutes before tipping pudding out on a plate. Preheat oven at 350°F. Prepare a 12-cup fluted pan with cooking spray and flour; set aside. To prepare batter, combine flour, 1 3/4 cup brown sugar, cinnamon, baking powder, and baking soda in a mixing bowl. In another mixing bowl, combine 3/4 cup margarine, 2 teaspoons vanilla extract, egg whites, and apples. Mix dry ingredients with wet ingredients just until moistened. Pour batter into prepared pan. Bake for 45 minutes. Then cool upright for 30 minutes; invert onto serving plate. Peel, pit, and dice 1 peach; reserve for shortcake batter. Peel, pit and thinly slice remaining peaches and place in a large bowl. Toss with 1/2 cup granulated sugar; let stand. Heat oven to 400º. Lightly coat 2 baking sheets with nonstick cooking spray. Sift flour, baking soda, cream of tartar, salt, and 1/4 cup granulated sugar into a large bowl. Beat together sour cream and egg in a medium-size bowl. Stir in reserved diced peach. Stir sour cream mixture into flour mixture just until blended; knead about 5 times in bowl if necessary to blend. Drop dough by scant 1/2 cups in 12 mounds onto prepared baking sheets, spacing 2 to 3 inches apart. Sprinkle tops with remaining 2 tablespoons granulated sugar. Bake in heated 400º oven 12 to 15 minutes or until golden and a wooden pick inserted in center comes out clean. Cool on wire racks slightly. Meanwhile, beat cream in a large bowl until soft peaks form. Beat in brown sugar and vanilla; beat until stiff peaks form. Split warm shortcakes in half. Spread each lightly with softened butter if you wish. To serve, place bottom of shortcake, buttered side up, on a serving plate. Follow cake directions as written on cake mix box. Remove from oven and cool cake completely. Meanwhile, in a medium bowl, combine strawberries, cognac and sugar. Let macerate 20 minutes. Invert and release cake onto a decorative platter. Whip cream with confectioners' sugar and vanilla at medium-high speed until it reaches stiff peaks. Do not over whip. Mix gelatin as directed on box. Refrigerate gelatin mix but do not let it harden, it should cool to a liquid consistency. 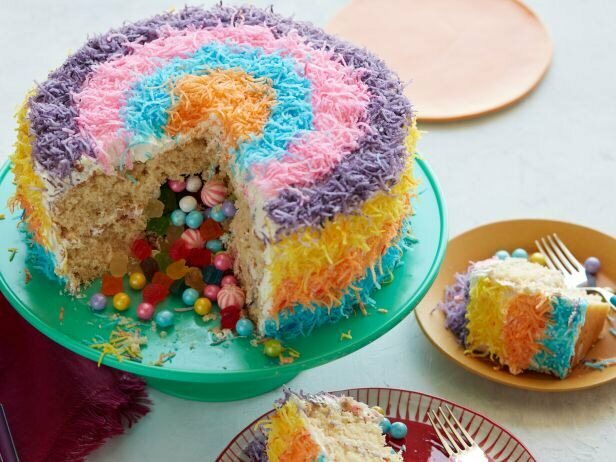 Using a straw, poke holes all over the cake. Pour gelatin into holes and spread over the top of the cake. Make the almond paste, or purchase it if you can, as it takes a lot of work. Beat the whites to moderately stiff peaks. Whip the yolks and the powdered sugar until you obtain a fluffy white mixture. Fold in, a bit at a time, the whipped whites, the starch, the flour, and the butter. Butter and flour a pan (say a round 10-inch pan)(I made cupcakes), pour in the batter, and bake it in a preheated oven until done, about 30 minutes. For cake: Upon removing it from the oven let it cool and slice it horizontally into 2 or three slices (depending upon its thickness). Sprinkle the slices liberally with alkermes and rum, and spread them with apricot jam. 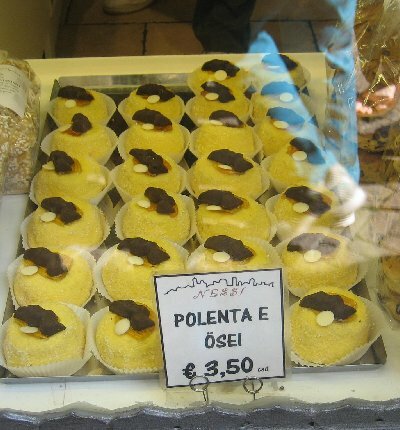 It's important that the cake take on the mound-like appearance of polenta turned out on a board. I piped the hazelnut cream inside instead of the apricot filling. Put the sugar in a bowl and combine it with the yellow to obtain a yellow wash. Use a little more food coloring to dye 3/4 of the almond paste. Roll it out with a rolling pin and lay the sheet over the cake, making sure it follows the contours of the cake, and folding the edges of the sheet under the bottom of the cake. 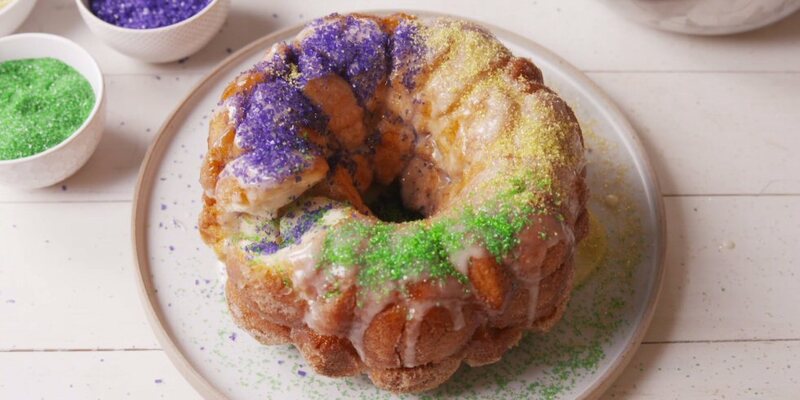 Brush the colored syrup over the cake, and then the clear liqueur (something almondy). While the cake is drying, shape the remaining almond paste into 2 or three birds, dust them with cocoa powder, and place them on the polenta. Store in a cool place until serving time. Make the cream: Process nuts in a food processor until they resemble coarse meal. Reserve 3 tablespoons; transfer remainder to a medium bowl. on electric mixer until well blended. Stir in carrots and walnuts. Cool; spread with frosting. 12 servings. Preheat oven to 350 degrees. Mix all ingredients in ungreased 13 x 9 inch pan. Stir vigorously for 1 minute. Bake cake for 35 to 40 minutes, cool and frost with Cream Cheese Raisin Frosting. Mix as directed and add 1/2 cup raisins, if desired. Pour pie filling into crockpot. Combine dry cake mix and melted butter. Sprinkle cake mix mixture over pie filling. Sprinkle chopped walnuts on top. Cover and cook on low for 2-3 hours. Heat oven to 350°F. Spray 24 mini muffin cups with Crisco® Original No-Stick Cooking Spray. Place 1 cookie dough round in each muffin cup. Place 2 teaspoons of the sugar in small bowl. Dip end of wooden spoon handle in sugar; carefully press into center of each cookie to make 1-inch-wide indentation. Cool completely in pan, about 20 minutes. set aside. In small microwavable bowl, microwave chocolate chips uncovered on High 30 to 60 seconds, stirring after 30 seconds, until smooth. Run knife around edges of cups to loosen; gently remove from pan. Dip rim of each cup into melted chocolate, then into walnut mixture. Place walnut side up on cookie sheet with sides. In another small microwavable bowl, microwave jam uncovered on High about 15 seconds until melted. *Spoon 1/2 teaspoon jam into each cup. Freeze cups about 5 minutes or until chocolate is set. Spoon ice cream into cups, using small cookie scoop or measuring tablespoon. Top each cup with fresh raspberry; serve immediately. *Prepare cookie cups until jam. Store covered up to two days at room temperature. When ready to serve, fill with jam, ice cream and top with raspberry. For the cake: Preheat the oven to 350°F. Grease 3 (9-inch) round cake pans with cooking spray. In large bowl, cream together the butter, light brown sugar, and granulated sugar until light and fluffy. Mix in the eggs, mashed bananas, sour cream, and vanilla until smooth. To assemble the cake, place 1 cake layer on a cake plate. Spread with 1/2 the container of chocolate-hazelnut spread and top with a thin layer of whipped cream cheese frosting, about 1/2 cup. Repeat with the second layer, using the remaining 1/2 of the chocolate-hazelnut spread and 1/2 cup whipped frosting. Cook's Note: You will use the chocolate spread only for the bottom 2 layers. Cook's Note: There are a couple different things that make this cake above and beyond, but by adding the "secret" ingredient of sour cream to the cake really makes for a much more moist cake. Also I love the sudden surprise of the Nutella in between each layer. For me it brings me back to being a kid and eating chocolate dipped bananas on a stick...known to some as the "Monkey Tail".Hungry Girl Website: Lisa Lillien - Recipe courtesy Sara A. Hodgson for 2011 Cooking Channel, LLC. Preheat oven to 350° F. Grease and flour a bundt cake pan (or 9 x 13-inch cake pan). 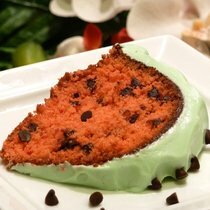 In a medium bowl, whisk together cake mix and instant vanilla pudding mix or gelatin powder until combined. Set aside. In a large bowl, beat watermelon, egg whites, vegetable oil, and red food coloring until smooth. Add dry ingredients, half at a time, and mix until well-blended. Batter will be thick. Fold in chocolate chips, if using. Pour into prepared pan and bake 40 to 45 minutes (30 to 35 minutes for sheet cake), or until toothpick inserted into the center comes out clean. Cool to room temperature before frosting. Source: Peggy Trowbridge Filippone, licensed to About.com, Inc.
Lightly grease a 6" x 2 1/2" cake ring and place on a tray on a sheet of parchment paper. Cream the butter and sugar in a bowl until the mixture starts to lighten. Melt the 4 ounces of dark chocolate and add to the butter mixture while constantly stirring. Spoon the mixture into the prepared cake ring. Try to fill all of the gaps on the bottom of the ring because this will be the top when it is unmolded.Chill the cake in the refrigerator for at least 3 hours. Remove the cake from the refrigerator and let it stand while you melt the 8 ounces of dark chocolate. Slide the ring off the cake and turn it upside down onto a cake wire. Carefully run a knife around the bottom of the cake where the chocolate has stuck to the cake wire and lift it onto a tea plate. Melt the remaining 1 ounce of chocolate and use to decorate the top of the cake. Prepare filling/frosting: Place the pudding mix and milk in a 2-quart saucepan over medium-high heat. Whisk constantly until the mixture comes to a boil and thickens, 4 to 5 minutes. Remove pan from heat, add the chocolate chips, butter, and vanilla; stir until melted, 2 minutes. Cover pudding with plastic wrap placed directly on its surface and let cool to room temperature, 45 minutes. Blend cake mix, cocoa powder, buttermilk, oil, eggs, and vanilla in a large bowl with a mixer set on low speed for 30 seconds. Stop mixer and scrape down the sides of the bowl with a rubber spatula. Increase mixer speed to medium and beat 2 minutes more, scraping down sides again, if needed (batter should be thick and well combined). Spoon a heaping 1/4 cup into each cup, filling two-thirds of the way. Bake in middle of oven until cupcakes are golden and spring back when lightly pressed, 17 to 20 minutes (you can also bake cupcakes in upper and lower thirds of oven, switching position of pans halfway through). Let cupcakes cool in pans on racks, 5 minutes. Remove 4 cupcakes from the pan, discarding paper, and crumble them into a bowl to make coarse crumbs. Remove remaining cupcakes from pans and place on racks to cool for 15 minutes before filling. Divide filling/frosting into two portions. Fit a pastry bag with a large round tip and spoon 1 cup of the filling portion into bag. Gently push the tip into the center of each cupcake and squirt a generous amount of pudding inside. Refill the bag as needed and repeat with remaining cupcakes. In a large bowl, combine the cake mix, 1 egg, and 1 stick melted butter, and stir until well blended. Pat mixture into prepared pan and set aside. In a stand mixer, or with a hand mixer, beat the cream cheese until smooth. Add the remaining 2 eggs, and the cocoa powder. Lower the speed of the mixer, and add the powdered sugar. Continue beating until ingredients are well mixed. Slowly add the remaining 1 stick of melted butter, and the vanilla, continuing to beat the mixture until smooth. Stir in nuts with a rubber spatula. Spread filling over cake mixture in pan. Bake for 40 to 50 minutes. Be careful not to overcook the cake; the center should still be a little gooey when finished baking. Cream oil and sugar, add water, eggs, then dry ingredients. Fold in carrots and nuts. Pour into a greased 9x13 rectangular pan or 2 9" round pans. Bake at 350°F for 40 to 45 minutes or until toothpick inserted into center comes out clean. Top with cream cheese frosting, simply super good! and mix again. Put your mug in the microwave and cook for 3 minutes on high. Allow to cool a little, and tip out onto a plate if desired. EAT! Preheat oven to 350°F. Lightly grease 8-inch round cake pan, line bottom of pan with parchment paper; grease. Arrange 1 1/2 cups berries in bottom of pan; set side. In bowl stir together flour, cornmeal, basil, baking powder, and salt. Set aside. In another bowl whisk together eggs, sugar, milk, and oil. Add egg mixture all at once to flour mixture. Stir until combined; pour over berries. Spread evenly. Grease 6 (6-ounce) custard cups. Melt the chocolates and butter in the microwave, or in a double boiler. Add the flour and sugar to chocolate mixture. Stir in the eggs and yolks until smooth. Stir in the vanilla and orange liqueur. Divide the batter evenly among the custard cups. Place in the oven and bake for 14 minutes. Heat oven 375°F. Coat 15x10x1" jelly-roll pan with Pam. Line with waxed paper: coat paper with spray. Dust with 2 tbl. confectioners' sugar. gradually adding gran. sugar until well blended. Beat in vanilla. In 2 additions, fold in flour mixture until combines. Scrape batter into prepared pan, spread evenly. Bake for 10 minutes until lightly golden and center springs back when lightly pressed. Cool in pan on rack for 5 minutes. Then invert cake onto sugar-dusted cloth. Remove pan and waxed paper. Dust top of cake with another 2 tbl. confectioners' sugar. Beginning at a short end, roll up cake, enclosing towel. Place cake, seam side down, on a cooling rack. Cool completely. In a small bowl, stir together mascarpone and confectioners' sugar. Unroll cake and spread with cheese. Top with raspberry jam, leaving a 1/4" border on short ends. Beginning at short end of cake, arrange rows of raspberries on cake. Carefully roll up cake without towel. Cover with plastic wrap and refrigerate 1 hour. Dust with confectioners' sugar before serving.8 servings. Frost the top of the cookie. Plase the cupcake upside down in the center of the cookie. Proceed by frosting the outer edges of the cupcake and so you'll have a delightful red dessert in the shape of a red hat. Decorate with purple flowers and ribbon or pipe purple frosting to make flowers and a hat band. Heat oven to 350F. Mix together first 7 ingredients into bowl; pour into un greased 9 x 13 pan. Sprinkle dry cake mix evenly over the top. Drizzle melted butter over and sprinkle with pecans. Bake until cake is set in center, about 1 hour and 15 minutes. Cool to room temperature and refrigerate several hours before serving. Serve with dollop of whipped cream. Serves 20. Sift together flour and salt. Add flour mixture to the creamed mixture alternately with buttermilk. Blend in vanilla. In a small bowl, combine baking soda and vinegar and add to mixture. Pour batter into 3 (8-inch) round greased and floured pans. Bake for 20 to 25 minutes, or until a toothpick inserted into the center comes out clean. Remove from heat and cool completely before frosting. Mix the softened butter, cream cheese, powdered sugar together until smooth. Add vanilla flavor. Preheat oven 325°. Grease and flour 10" tube pan. Sprinkle nuts over bottom of pan. Mix all cake ingredients together. Pour batter over nuts. Bake 1 hour. Cool. Invert on serving plate. Prick top. Drizzle glaze. Glaze: Melt 1/4# butter in saucepan. Stir in 1/4 c. water and 1 c. gran. sugar. Boil 5 min. stirring constantly. Remove from heat. Stir in rum. Preheat oven to 350°F. Line two standard muffin tins with cupcake liners. In small bow combine food coloring, cocoa, and vinegar. Set aside. In large bowl, combine sugar, oil, eggs, and buttermilk. Beat until well blended. Slowly add flour, baking soda, and salt. Stir in vanilla extract. Fold in red coloring. Spoon batter into cupcake liners, filling 3/4 full. Bake 15-20 min. or until cupcakes spring back when lightly pressed. Cool in pan 5 min. Remove and place on wire rack until completely cooled. Ice each with cream cheese frosting. In large bowl, beat cream cheese and butter until fluffy. Slowly add powdered sugar, beating until smooth. Stir in vanilla. Using a pastry bag with star tip, pipe frosting on tops of cooled cupcakes. Mix all above ingredients together. Place in a 13"x9" buttered cake pan. Bake 350°F 25 to 30 min. Set oven 350°F. Beat eggs, sugar, oil. Combine flour, salt, baking powder, add to eggs mix, along with orange juice. Add vanilla. Toss peaches with sugar and cinnamon. Pour 1/3 batter in greased tube pan. Add 1/2 peach mixture, add another 1/3 batter, then rest of peach mix. Then rest of batter. Bake one hour. Sprinkle with the conf. sugar when done, after ten minutes of cooling. Mango mixture: Melt sugar in a skillet over medium heat, allow to brown and stir constantly. Add butter and pineapple juice, cook until syrup forms. Place the slices of mango in syrup and cook 3-5 minutes, or until lightly brown, turning occasionally. Grease a baking pan or dish. Place mango in bottom of pan, pour syrup over; allow to cool, to form a semi-solid surface, then pour in cake batter. PREHEAT oven to 375°F. Grease 15 x 10-inch jelly-roll pan; line with wax paper. Grease and flour paper. Sprinkle towel with powdered sugar. Prepare chocolate cake batter according to package instructions and pour into the prepared pan. In a bowl combine ricotta cheese, sugar, and vanilla; mix until thoroughly combined. Pour over the cake batter. Swirl through the batter with a knife. Meanwhile, combine instant chocolate pudding mix and non-dairy whipped topping. Beat with an electric mixer on medium speed until smooth. Chill until the cake has cooled then frost. Mix well with wooden spoon. Cool completely on wire rack. 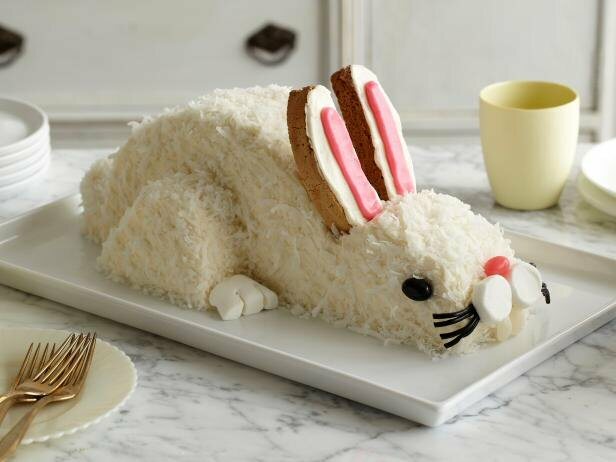 Spread with cream cheese frosting. Store in fridge. Beat cheese with butter in medium bowl. Beat in confect. sugar with vanilla. Add 2 tsp. milk, if necessary to make frosting of spreading consistency. Yellow cake mix on top of fruit. Sprinkle on nuts. Dot with margarine. Bake cake in 2 9-inch layer pans according to package directions; cool completely. Slice layers in half evenly to make 4 rounds (thin string or dental floss is great to do this). Pour Kalhua into a measuring cup; sprinkle with gelatin and let soak 5 minutes. Heat mixture in microwave 20 seconds, or until warm to the touch and gelatin is dissolved. and spread, leaving the sides bare. Sprinkle each layer evenly with chopped Skör bars. Stack the cake rounds on a large plate; refrigerate at least 2 hours uncovered to allow gelatin to set. Sift flour, sugar, salt & baking powder twice into bowl. Put 2 eggs in a 2 cup measuring cup. Beat with a fork to blend white and yolk. Add enough milk to eggs to make a 2 cup measuring cup full. Add to dry ingredients along with oil and vanilla. Stir, do not whip, dough may be slightly lumpy. Pour into greased 9x12x2" pan. Over dough, carefully pour 3 cups of fruits, fresh or canned*. Sprinkle fruits evenly with 1 cup of sugar**. Spices may be added if you are using fruit that needs spice (apples, pears, etc.). Bake at 350° for about 1 hour. Testing a cake portion near middle to be sure that it is not doughy. Very good with almost any fruit. This recipe can be easily cut in 1/2 if you wish to make a smaller cake. *IF canned fruits are used, they must be well drained. Make cake on cookie sheet. Mix 1 cup milk, pudding, cream cheese & cool whip. Spread on cooled cake. Top with cherries, nuts, pineapple and coconut. Combine ingredients and mix. Pour into tube pan. Bake 350°F for 50-60 min. 1\4 cup butter or marg. Melt butter over low heat in round spring pan.9x1x1\2. Sprinkle brown sugar evenly over butter. Place pineapple slice in center of pan. Cut remaining slices in half; arrange halves cut sides out around pineapple ring in pan. Place cherries in pineapple slices; arrange pecans around center ring. Prepare cake batter. Pour cake batter evenly over fruit in pan. Bake 35-45 min. Invert onto plate. Leave pan over for a few min. Serve warm with whipped cream. Serves 9. Grease and flour tube or bundt pan. Combine ingredients and pour into pan. Bake 50-60 minutes. Mix pumpkin, milk, sugar, eggs, salt and spices in a bowl and pour into a 9x13 greased cake pan. Sprinkle yellow cake mix on top and pat it down. Sprinkle nuts over the top, melt butter and drizzle that over the top. Bake at 350°F for 45-60 mins. In a medium size bowl, combine graham wafer crumbs, crushed pecans and melted margarine, mixing well to blend. Spoon mixture evenly into a 12 cup muffin pan lined with baking cups. Press with a spoon to firm bottom. raspberry puree' and mix until well blended. Fold in whipped topping. Spoon evenly into baking cups. Freeze for at least 5 hours. When ready to serve, remove paper liners. Invert cakes and place on a serving plate. Serve frozen with remaining raspberry puree'. Garnish with a few whole raspberries. Combine first 4 ingredients in bowl. Blend 2 min. Spoon 1/3 batter into bundt pan buttered & sugared. Sprinkle 1/2 of the jello mix over batter. Repeat layers. Micro 9 min. on simmer & 5 min. on high using lower rack. Stand 5 min. Remove from pan. Cover with plastic wrap to cool. Sprinkle with confectioners sugar. Preheat oven to 400°F. Line two 10"x15" jellyroll pans with parchment or wax paper so that paper extends 1" over short ends of pans. Combine flour, baking powder and salt, in another bowl with mixer at high speed beat eggs until very thick, about 5 min. Gradually beat in 1 1/3 c. sugar until mixture falls in thick ribbon from spatula, about 5 min. Beat in vanilla. Sprinkle 1/3 flour mixture over egg mixture; fold together until just incorporated. Repeat sprinkling and folding in remaining flour mixture. Divide batter evenly between pans; gently level with spatula. Bake 8 min. or until cakes are springy to the touch and tooth pick inserted into centers comes out clean. Cool in pans on racks 5 min. With knife loosen cake edges. Invert cake onto clean dish towel (sprinkle a generous amount of conf. sugar on towel to prevent cake from sticking); peel away paper. Starting with short side roll up cake in towel; let stand 10 min. Unroll cake; cool completely. Cover with plastic wrap until ready to use. 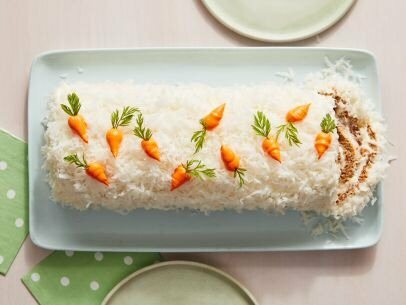 Unroll cake and spread with a layer of semi-softened sherbet. Roll back up and freeze. Spread with frozen yogurt, ice cream or pudding. Combine cake mix and pudding, add oil and sherry, mix well. Add eggs, one at a time, and mix well after each egg is added. Add vanilla and butter extract and beat for 6-8 minutes at high speed. Pour 1/3 of batter into pan, sprinkle with sugar-cinnamon mixture, etc. Bake at 350° for 50 minutes. Remove from oven and place on wire rack to cool exactly 8 minutes. 1/4 cup sugar and 1 tbl. cinnamon. Mix all ingredients by hand. Bake in a greased/floured bundt pan at 300°F for 1 1/2 hours. Cool in pan for 1 hour. Place cake mix, melted butter and 1 egg in large bowl. Beat on low speed until well combined, about 30 seconds. Measure out 2/3 cup batter; set aside. Spread remaining batter in bottom of ungreased 13 x 9 x 2" baking dish. Bake for 15 minutes or until top lightly browns and puffs up. Remove dish to wire, and cool for 10 minutes. bowl of electric mixer. Beat on low speed for 1 minute. Stop machine; scrape down bowl. Beat on medium speed until well combined, about 1 minute. gently smooth out evenly over cake. Bake for 40 to 45 minutes or until edges are browned but middle is still soft. Remove to wire rack, and cool 30 minutes. Mix crust ingredients together and press into 9x13" pan. Bake 375°F for 15 min. Cool. Mix cream cheese, powdered sugar & ½ cool whip. Cover cooled layer with bananas. Mix pudding with milk and layer next. Top with rest of cool whip. Heat oven to 350º. Grease and flour two 9-inch round cake pans. Prepare brownie mix according to package directions for cake-like version. Divide batter evenly between pans. Bake 18 to 20 minutes. Do not over bake. Cool 10 minutes. Remove from pans to wire racks to cool completely. Place one brownie layer on serving plate. Top with 2 cups of the whipped topping, spreading to within 1/2 inch of the edge. Spread 1 cup cherry pie filling over whipped topping. Top with second brownie layer. Spread remaining cherry pie filling over top to within 1/2 inch of edge. Dollop or pipe remaining 1 cup whipped topping around edge of torte. Sprinkle toasted almonds over top. Yield: 12 servings.